Bluffs along the Hayes River valley, 31 km northeast and 40 km downstream from Hayes Volcano, reveal volcanic deposits that shed new light on its eruptive history. Three thick (>10 cm) and five thin (<10 cm) tephra-fall deposits are dacitic in whole rock composition and contain high proportions of amphibole to pyroxene and minor biotite and broadly correlate to Hayes tephra set H defined by earlier investigators. Two basal ages for the tephra-fall sequence of 3,690±30 and 3,750±30 14C yr B.P. are also consistent with the Hayes tephra set H timeframe. Distinguishing among Hayes tephra set H units is critical because the set is an important time-stratigraphic marker in south-central Alaska and this section provides a new reference section for Hayes tephra set H. Analysis of Fe-Ti oxide grains in the tephras shows promise for identifying individual Hayes deposits. Beneath the dacitic tephra sequence lies an older, poorly sorted tephra (tephra A) that contains dacite and rhyolite lapilli and whose basal age is 4,450±30 14C yr B.P. Immediately below the tephra-fall sequence (Unit III) lies a series of mass-flow deposits that are rich in rhyodacitic clasts (Unit II). Below Unit II and possibly coeval with it, is a 20–30 m thick pumiceous pyroclastic-flow deposit (Unit I) that extends to the valley floor. Here informally named the Hayes River ignimbrite, this deposit contains pumice clasts of rhyolite with quartz, sanidine, plagioclase, and biotite phenocrysts, an assemblage that is unique among known Quaternary volcanic products of Hayes and other Alaskan volcanoes. Units I, II, and tephra A of Unit III represent at least two previously unrecognized eruptions of Hayes Volcano that occurred prior to ~3,700 yr B.P. No compositionally equivalent distal tephra deposits correlative with Hayes Volcano rhyodacites or rhyolites have yet been identified, perhaps indicating that some of these deposits are pre-Holocene, and were largely removed by glacial ice during the last ice age. More field and analytical work is needed to further refine the eruptive history of Hayes Volcano. 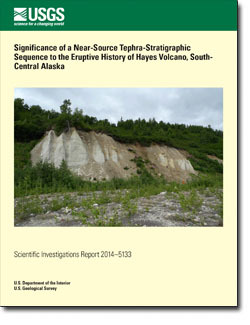 Wallace, K.L., Coombs, M.L., Hayden, L.A., and Waythomas, C.F., 2014, Significance of a near-source tephra-stratigraphic sequence to the eruptive history of Hayes Volcano, south-central Alaska: U.S. Geological Survey Scientific Investigations Report 2014-5133, 32 p., http://dx.doi.org/10.3133/sir20145133.